Oh, my. What was I saying about frilly cushions? 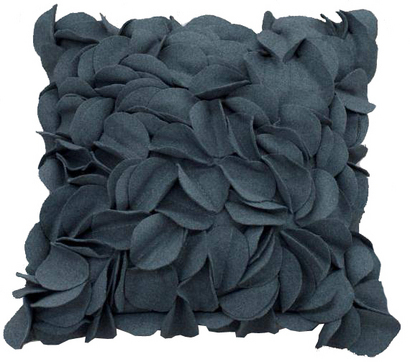 Not like I need another one to toss on my wee sofette, but I can’t resist this felt flower beauty from Urban Barn ($39). Embellished with piles of pretty petals, it’s perfect for adding a touch of texture to a space. The sophisticated charcoal grey will work wonderfully with my fuchsia, purple and cream cushions and throws – I must snag one (or two) before they’re gone! Another thing I can’t resist? Entering Urban Barn’s Win a Private Chef contest! Just “like” Urban Barn on Facebook for a chance to win a gourmet dinner for eight cooked by Dale MacKay, winner of Food Network’s Top Chef Canada. We love your post about Urban Barn, and about your other fun finds too! I would love to get in touch with you and talk decor and Urban Barn and learn a little more about your blog. Please contact me so we can chat. Thanks Jess! I really need to scoop up the cushion before it sells out! It’s gonna go fast, no doubt.